It is the nature of WordPress websites to contain many posts, images, articles, documents and other various digital media. After your website has been around for a while, you are likely to find yourself with a collection of various documents and digital media that you have been posting and uploading with time. In addition, if your line of work is that of a publishing or research, chances are that you may have various publications, articles, and research documents that you would like to share with your intended audience in an organized fashion. A few WordPress plugins out there somewhat make this possible for you but none of them seems to be doing a great job so far. Well, not until the Posts Table Pro WordPress plugin came into existence. If you are in any of the situations I’ve highlighted above, let me show you why Posts Table Pro will change your life for good. The first and obvious benefit the Posts Table Pro plugin brings to the table is organization. The plugin enables you to display your articles, documents, music, publications, and other digital media in a tabular fashion that is presentable and easy on the eye. It even allows you to add custom featured images to accompany the digital media you want to share with your intended audience. For instance, you can have a distinctive image for PDFs, another for Word documents, and another for Audio files. They work pretty much like icons. The tabular presentation style of the plugin makes it easy to organize your digital media and the icons make them even more distinguishable and identifiable by type. This WordPress document library plugin comes with various convenient features to make it easy for your site visitors to find documents. It comes with a search feature that enables visitors to search for documents by title or any information they may have about them. It works just like a standard search feature. This feature is ideal if your site has hundreds or even thousands of documents. Instead of visitors using the pagination feature to search for documents page after page, they can just enter the name of the document or file (if they know its name) and it’ll show up in the blink of an eye. The sort feature enables your site visitors to sort your documents by date, alphabetically or using other criteria you make available for them. This is convenient when a visitor is looking for a file that he or she knows little about. Sorting by date, in particular, is useful for when a visitor is looking for a file that is months or even years old. If your site has hundreds or even thousands of articles, this feature will enable them to find documents that were uploaded or posted 2 or even 5 years ago. For research and publication WordPress websites, this is a very convenient feature. 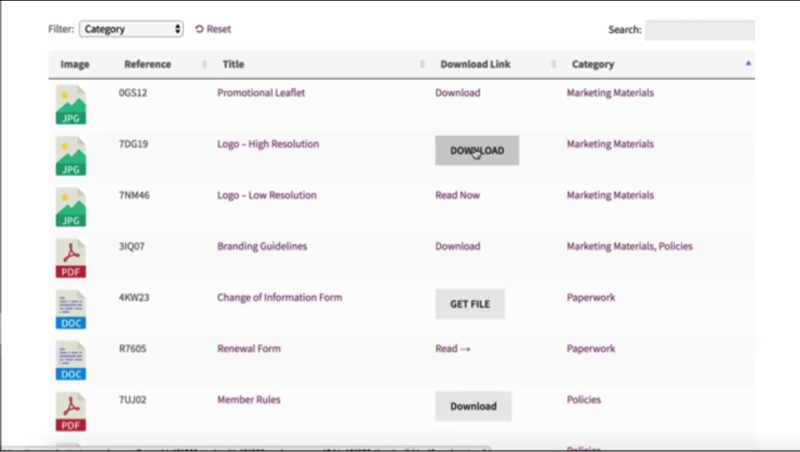 The filter option enables visitors to search for files based on their type or category. For instance, if your library contains mixed digital media like music, PDFs, videos, and Word documents, the visitor can just search for PDFs only and filter out other file types. This narrows down their search significantly and makes it easy for them to identify the particular file they are interested in. The Posts Table Pro WordPress plugin also enables you to provide files that are downloadable through your custom document library or directory. It is easy to install and fully customizable. This plugin is in a class of its own. If your WordPress site is dealing with many documents or other digital media that you would like to offer to your site visitors in an organized, searchable and sortable way, this is the plugin for you.